Home | Discount Leotards ™ > Gymnastics Leotards > Trolls Minions Leotards > E3768 Star Minion Kevin Carl Dave from Despicable Me - Sublimated subfuse and shocking pink nylon racerback tank gymnastics leotard. E3768 Star Minion Kevin Carl Dave from Despicable Me - Sublimated subfuse and shocking pink nylon racerback tank gymnastics leotard. 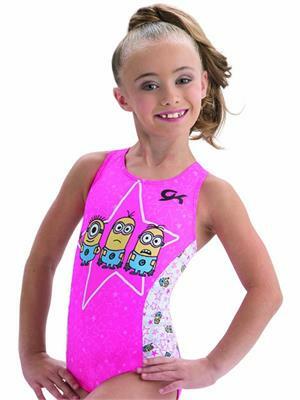 E3768 Go Bananas over this starry leotard featuring the Minions from Despicable Me. Scoop neck sublimated leotard with shocking pink nylon/spandex racer back.